This recipe calls for already roasted spaghetti squash. We have included the directions below to roast a squash. Roasted squash can be kept covered in the refrigerator for up to 3 days. This is a great vegetable to cook ahead, when you have more time, and have it ready to re-heat later in the week. * To Roast a spaghetti squash: Preheat the oven to 375°. With a small sharp pairing knife prick 1 medium squash (about 3 pounds) all over. Place it on a rimmed baking sheet and roast until tender when pierced, about 1 hour and 20 minutes. Flip the squash halfway through cooking. When it’s cool enough to handle, halve it lengthwise and scoop out the seeds. 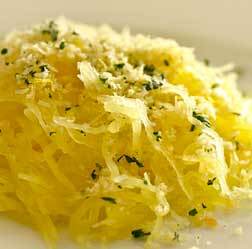 Scrape the squash into a bowl with a fork, it will naturally make long spaghetti like strands. In a large skillet, melt the butter substitute over medium heat. Add shallots and garlic and cook until softened, about 7 minutes. Stir in thyme and rosemary and cook until fragrant. Add the roasted squash and cook until warmed through. This entry was posted in Entrees, Vegetables and tagged make ahead, Metabolic Medical Center Recipes, metabolic recipes, roasting, spaghetti squash, squash by foodies4mmc. Bookmark the permalink.